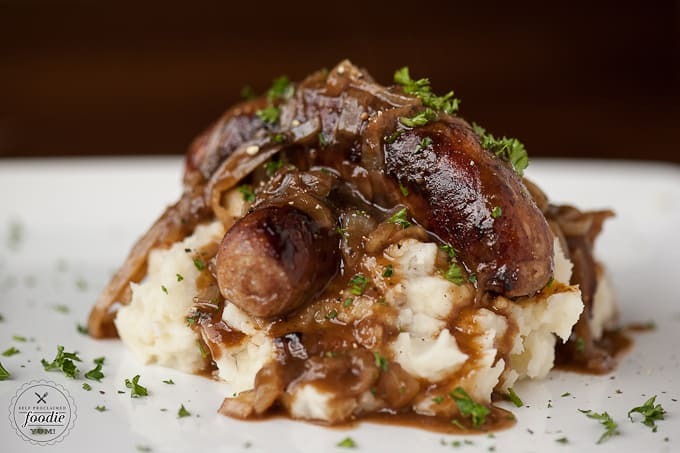 Bangers and Mash with Stout Onion Gravy is a traditional quick and easy dinner made from sausages, buttermilk mashed potatoes, and a savory gravy loaded with onions. This recipe originated from the British Isles and can be made with any kind of sausage. The Irish Stout adds intense flavor to the sausage and the gravy. 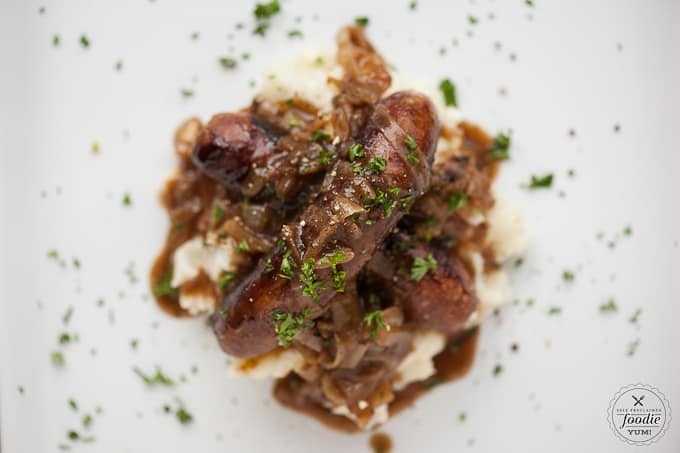 Bangers and Mash with Stout Onion Gravy was a fun recipe for me to make. I had never made bangers and mash before. Every good meal deserves a good sauce and boy does this stout onion gravy take this meal over the top! The stout onion gravy is what ties everything together. Its basically awesome. Guinness was my stout beer of choice. And, although my kids like to pick out the onions, they loved the flavor of the gravy. And yes, I serve my kids lots of food that’s made with alcohol. But only after its been cooked down to no longer be boozy. The boozy stuff is only for mom and dad. If you’re judging me right now, I’m guessing you don’t cook with beer or wine. I love making this recipe for St. Patrick’s Day, but it makes an outstanding dinner any time of year. Love recipes using stout beer? You wouldn’t believe that I actually don’t enjoy drinking stout beer based on the number of recipes I’ve made using stout beer, but it is outstanding in both savory and sweet recipes! Irish Cheddar Shepherd’s Pie – I do love me a good shepherd’s pie! I threw in everything Irish that I could from the Kerrygold butter and cheddar to the Guinness stout. Meat and veggies smothered in a savory sauce, topped with mashed potatoes, and baked up together. Yum! Guinness Ribeye Steak – Everyone knows beer + steak go well together. But steak cooked in beer? Mercy. Irish Cheddar Stout Bread – Ever make beer bread? It’s super easy to make. The Irish cheddar and stout add great flavor to this recipe. Black Velvet – Such a simple drink. Pair a bitter dark stout with a light crisp champagne and you have a whole new cocktail! Chocolate Guinness Float made with Guinness Chocolate Sauce – This one might blow your mind. Pour stout beer over vanilla ice cream and then top it with a chocolate sauce made with stout beer. Does it sound weird? Yes. Is it delicious? Oh yes. Guinness Chocolate Cake – This was actually one of my most favorite dessert recipes ever. I never thought adding something like a bitter stout beer to a dessert recipe could be so good. The stout adds the slightest bitter notes to this sweet cake, but also makes it incredibly moist and delicious. What does bangers and mash mean? Bangers means sausage. Mash means mashed potatoes. You might be wondering what vegetable goes well with bangers and mash? Peas. When in doubt, always throw on some peas. Especially if you have mashed potatoes and gravy for them to stick to. Why is it called a banger? I found an interesting article that discusses the origins of some popular foods. I’ve known sausages have been referred to as bangers because they pop when they cook. Now, we all know that a good sausage or hot dog will split when it’s cooked, but does it really pop? The article states that “The sausage, one of the oldest types of processed food in history, can be traced back to ancient times. British pork sausages have been mass produced since the 19th century. After the outbreak of World War I, food shortages led to a dramatic reduction of meat, of any sort, in sausages. How do you cook bangers? Because I start with raw sausages, you have to ensure they get cooked through. I love to cook my bangers in a saute pan with a lid. I like to give them a good sear on the outside, but the lid helps steam the sausages and cook them all the way through. By adding Irish stout to the pan and then covering it, the stout evaporates into steam. This not only helps cook the sausage, but it infuses that intense dark flavor into the meat and makes it more tender. 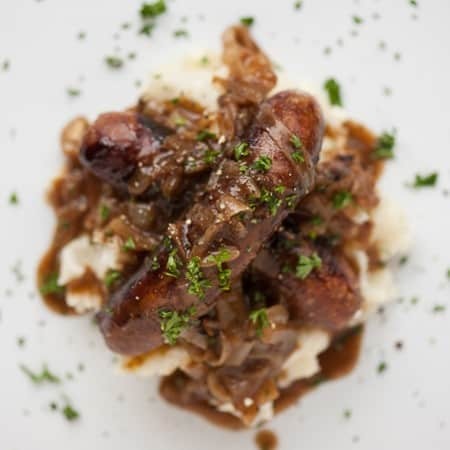 Are bangers and mash English or Irish? It’s typical “Pub Grub” you might find anywhere in the British Isles including Great Britain and Ireland. It’s a relatively easy dinner to make either for a family or in large quantity if serving a crowd. If you want to make this meal specifically Irish, use an Irish stout like Guinness to cook the sausage and gravy like I did for this recipe. If you want to make this meal specifically British, just serve plain sausage with flavorless mashed potatoes. I kid! I kid! Well, sort of. 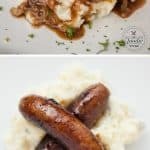 Bangers and Mash with Stout Onion Gravy is a traditional quick and easy dinner made from sausages, buttermilk mashed potatoes, and a savory gravy loaded with onions. This recipe originated from the British Isles and can be made with any kind of sausage. 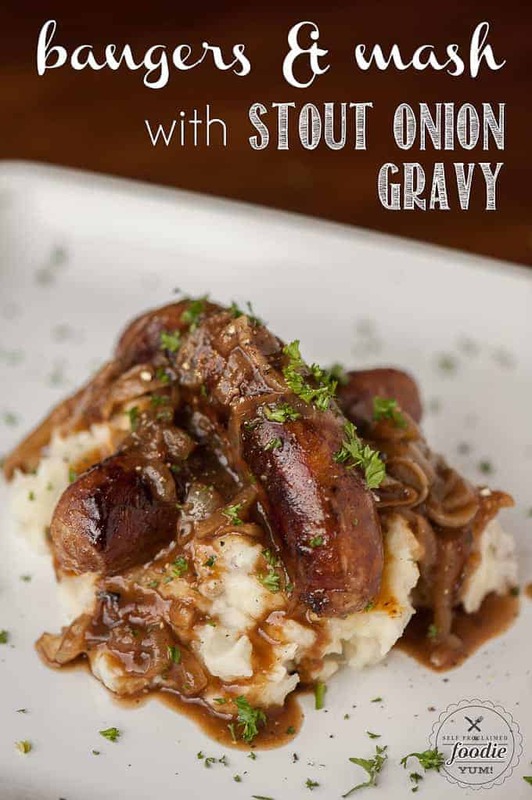 The Irish Stout adds intense flavor to the sausage and the gravy. Heat oil in a skillet over medium high heat. Add sausages and stout. Cover with lid and crack just to allow enough steam to escape. Cook covered for about 10 minutes, turning half way through. After they've cooked for 10 minutes, remove lid and allow the liquid to reduce a bit and coat the sausages. When the liquid is almost gone, lower heat to medium low and continue cooking with the lid on, rotating occasionally, until evenly browned and cooked through, about another 10 minutes. In a separate pot, heat butter over medium high heat. Add sliced onions and cook until slightly brown and fragrant, 5-10 minutes. Sprinkle with flour and allow to cook 2-3 minutes. Add stout and scrape bottom of pan to deglaze. Add beef broth and allow to simmer until no longer foamy, 10-15 minutes. In large pot cover potatoes with water and bring to a boil. Cook until soft. Drain and add butter and buttermilk. Mash to your preferred consistency. To serve, top potatoes with sausage(s) and top with as much gravy as your heart desires. I love this recipe. The only thing I changed is when sautéing the onions, I sprinkle a couple spoonfuls of brown sugar. It makes the stout gravy awesome. Oooooh thanks for the suggestion! I think this is a wonderful recipe. I’m wondering if I’ve doing something wrong though: both the temps for the bangers and the gravy seemed WAY too high. The sausages burnt, and the 3 ounces of stout evaporated in couple of seconds, with just burnt sugars and no liquid to cover the sausages. I ended up turning the temp way down and using much more stout and ended up kind of boiling them, which seems like a valid way to do it, as you would boiling brats in beer. Also, medium high for the gravy quickly burnt the butter and then ended up burning the flour. The gravy ended up being bitter, I think because of this. I do want to emphasize this is an excellent recipe and I don’t think there’s anything wrong with the amounts of any ingredient except the beer in cooking the sausages. I’m curious to see what your thoughts are on this, especially if I didn’t do something right. I realized ovens are different, but medium high seems like more than just adjusting a knob a little. I just served this recipe up and LOVED IT! I did make a few adjustments due to my husband’s dietary requests. First, I sautéed the onion in olive oil instead of butter. I used turkey brats to make it a little healthier. In the potatoes, I didn’t use butter, but instead used half a cup of sour cream, a splash of milk, salt and pepper to taste, and fresh chives from our garden. It was delicious and I will definitely make this again! I made this dish last night warmed it up this morning and took it to work for a potluck. Got lots so positive comments on how good this dish was. Will definitely make this again. I made this recipe and much to my dismay the gravy was virtually unservable. It looked perfect – onions beautifully caramelized, gorgeous color, perfect consistency- but it was unbelievably bitter. I’m thinking just WAY too much beer… Or maybe I just chose the wrong type of beer (it was an Irish stout). I had to re-make the gravy using another recipe ? Sorry it didn’t work for you! We really loved it, but it just may be personal preference when it comes to the dark beer. Made this today with Trader Joe’s Irish Bangers. It was fantastic! Becoming a new St. Patrick’s day tradition in our house!! Great recipe. I added 1-2 tsp if maple syrup and Traegered my sausages… so good!!! I want to make this but I am worry about the beer part. Both my son and I are disabled and we take many different kinds of pills. Should I still use the beer even tho we take lots of medication? Bangers and Mash came out great – not so the Gravy. Followed the recipe – with the exception of adding more onion since we like onion flavor -,but pretty tasteless. I think the proportion of beer is too high. I used a Yengling Black + Tan which given the previous posts of Guinness being too bitter, it should have worked. I will try again, but this time add in the beer a tablespoon at a time. Hi Leslie, Thanks for the comment and sorry the gravy wasn’t awesome. Hopefully it’s just a matter of preference and you’ll like it better next time.